Can you believe the 4th of July is almost here?! Well I can't. If you happen to need some pinwheel cookie flair for the 4th then I've got you covered. 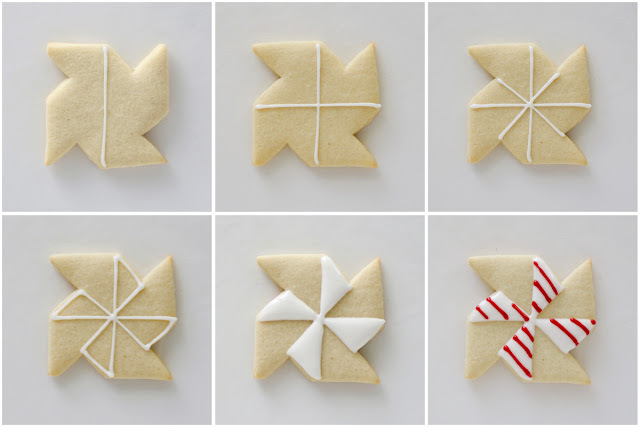 These are the best kind of decorated cookies because they look complicated but they're totally easy. You can wow your friends at the BBQ! A pinwheel isn't a common cookie cutter but that's okay because you don't really need one. Start by cutting a square. 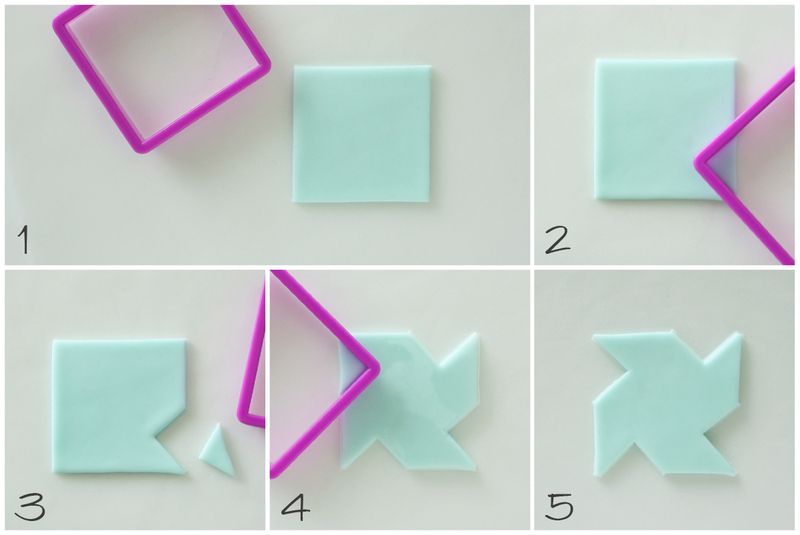 Use a corner of the square cutter to clip a little triangle from the side of the dough. Work around the square clipping a triangle from each side. To get all those little triangle cuts straight and even it's soooo much easier if you use a template as a guide with the cutter. This approach is like a hybrid between hand cutting and cutting with a cookie cutter. 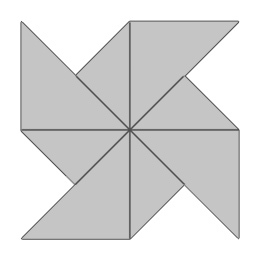 You can size the pinwheel template to fit your square cookie cutter like I did or make pinwheels in a variety of sizes by cutting around the sides of the template with the square cutter as well as cutting out the points. 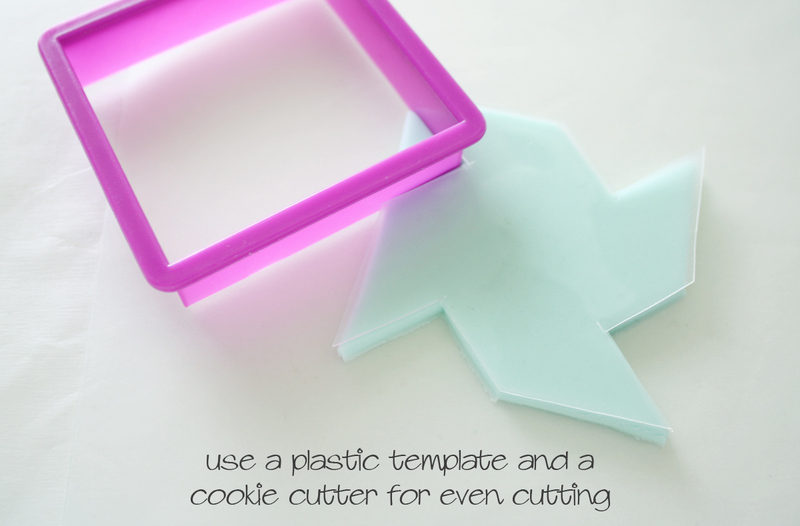 You can size and print the template below onto cardstock and throw it away when you're done with your cookies or you can print and trace the template onto clear plastic from a deli container lid or a milk jug and use it again some time. The "trickiest" part of decorating the pinwheel cookies is getting the first triangles in the right place and honestly it's not that tricky at all. Pipe a line down the center of the cookie from the edge of one triangle to the other. Pipe the same line across the cookie horizontally. Pipe a line from the point of one triangle down to the opposite point crossing at the center. Repeat from the other side. Close off the little triangles. Don't worry too much about all the points matching up perfectly in the center of the cookie because you're going to cover them later anyway. Flood fill the little triangles before the outline dries to help prevent cratering in the small areas. If you like you can add details while the icing is wet. The wet lines will sink into the wet base and dry smoothly. (This is known as wet on wet technique) Personally, I like to wait until the base is dry before adding details but that's just me. After the small triangles have dried for a few hours outline the large triangles. Let the outline set up a minute or so and then flood fill the large triangles. Let the icing dry for several hours and finish off with piping details. 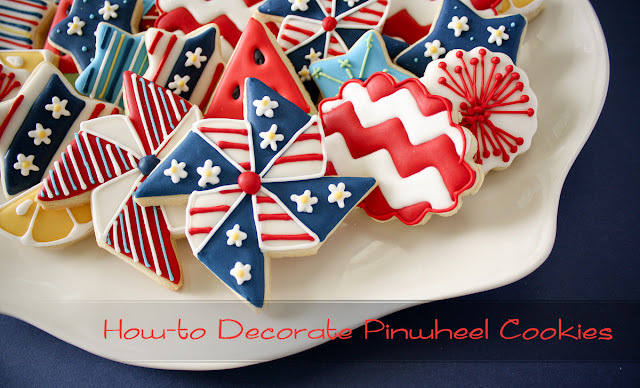 Don't forget to add a dot of icing in the center for the "pin" to complete the pinwheel. You can get as fancy or stay as basic as you like with the piping details. They look great in simple solid colors or covered in dots and stripes. I probably got a little too crazy with the details but they look great anyway! For a cute spin on stars and stripes try tiny white flowers instead of stars and chevron stripes. Plus a little touch of yellow and aqua freshens up the traditional red white and blue while still remaining patriotic. If you'd like to see a totally different approach to making 3D pinwheel cookies you should check out this cool post by Not Your Momma's Cookie! Great collection. Your decorated pinwheels are wonderful (I don't think you went a little crazy with the details at all) Cute firecracker bursts too! Have a wonderful 4th of July celebration. OMG! Thank you very much for the tutorial. It's amazing! Incredible! I love how you simplified the pinwheel! Thank you so much for making it easy!! Awesome tip! Pinwheels are so much fun and so is the rest of your festive platter of cookie! Have a Happy 4th of July! You are so talented, I like everything you do because you are so creative. Everytime I come in your website I want to do the same as you. One day I'll learn and try. Thanks to you. Oh my goodness! These are SOOOOO pretty! Thanks for the visual! Love your pinwheel cookies!